The artistic side of M.T.P.S. The musicians of "De Calm", a band from Toulouse, are to complete their French tour "Le Tour Métrage" in the land of Guillaume Carayol this evening at 7.00 p.m. with an apéritif and concert hosted at the Saint Baudille Youth Community Center. "This album "Le Film Définitif" is the outcome of our proud project "ciné-musical" ("On-Screen Music"), " storyteller and singer of the band Guillaume Carayol explains. We have been patient, we have been tuning up our skills and perfecting our concerts, and we have just filmed a music clip. The song featured is "L'Idylle", and through her choregraphy Sibille must express the passion in an idyll in the unusual context of a warehouse and under the gaze of the workers. The shooting took place in the old mine premises at Noailhac, the home of MTPS Special Works Division. "We received a warm welcome from Philippe Carayol, another native of Baudille. The shooting team was "mazametan", the director pointed out. Namely: Sybille Planque, a professional dancer who leads a dance company in Paris, (Compagnie Les Nébuleuses); Simon Barthès, the son of Philippe Barthès ( the sound and image technician), who is also attending an audiovisual techinican school in Montpellier; Elodie Farenq as make-up technician; and Gilles Arnaud from Saint Baudille as the worker. The expatriate seems to have stood up to the challenge of developing a novel artistic approach. Here is the scene: a public works employee who kills himself working seems to have lost purpose in life. The people from Saint Salvy acted as extras. A foreman calls out to the workers and suggests that they head for the warehouse nearby. As if they were watching a show, they can make out below the figure of a man clad in a dark suit who is walking towards them but suddenly stops and stares. 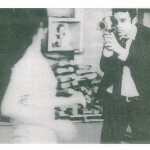 He is holding a super-8 camera and his face is blank. A young woman comes up from behind. One might wonder whether or not the camera is a weapon, some sort of a gun, since the dancer so closely resembles a moving target. Music: guitar, battery and bass!